After the opening reception, visits by appointment only. Please contact Larissa Ferreira at larissa@annexb.net. The horizon is a sight often taken for granted. It is always there, and it will always be there, surrounding us, even if hidden behind layers of skyscrapers that proliferate in cities across the globe. Universal and stable: the line between the firmament and the ground keeps us together, maintain us ashore, inland, while life around may be chaotic, falling apart. If this stability protects us, what happens when two skies meet? Working mostly in printmaking and large scales, Santidio Pereira mingles organic-like, nature-inspired elements with themes such as childhood memories or the urban culture of São Paulo, where he lives. The works in Between Two Skies, Pereira’s first solo show in New York, invite us to imagine the collapsing of the horizon, the multiplying of firmaments and grounds, as they become one. In another series of works, bulbous plants, algae, fish, and hummingbirds appear in Pereira’s prints. These almost-abstractions burst in earthly and watery shades, as plants and animals get juxtaposed. His shapes, abstracted from nature, are similar to modernist artists’ cut-outs, but they do not remain loose or fragmented, they come together, entwined. Color plays a fundamental role in Pereira’s works: the artist balances serene and vibrant shades, creating unifying compositions that are at the same time comforting and energizing. The organic quality of these pieces is intensified by the wooden texture perceived on the prints. The other four minimalist abstract Untitled works shown here suggest the possibility of inversion and permutation of the horizon line that grounds our experience of seeing a figurative painting, or overall, of being a vertical body in the world. Positive and negative spaces in three-part compositions, transform, moving up and down the work’s surface, until they coalesce, intersect. It is this character of entirety in Pereira’s works that binds them together: a desire for making the world full, and whole. Santidio Pereira was born in Curral Comprido (Piauí) and lives and works in São Paulo. With the incentive of his mother, Pereira has, since his childhood, studied printmaking at the Instituto Acaia which offers art lessons to youth living in favelas in Sao Paulo. Today, Pereira’s work has been receiving quick recognition. He had his first solo exhibition in 2016 at Galeria Estação, which represents him, and is AnnexB’s partner to support his residency. His works have been recently shown at SESC 24 de Maio, Instituto Tomie Ohtake, SESC Santo Amaro, SP Arte 2017, Centro Cultural São Paulo, and PINTA Miami 2018. 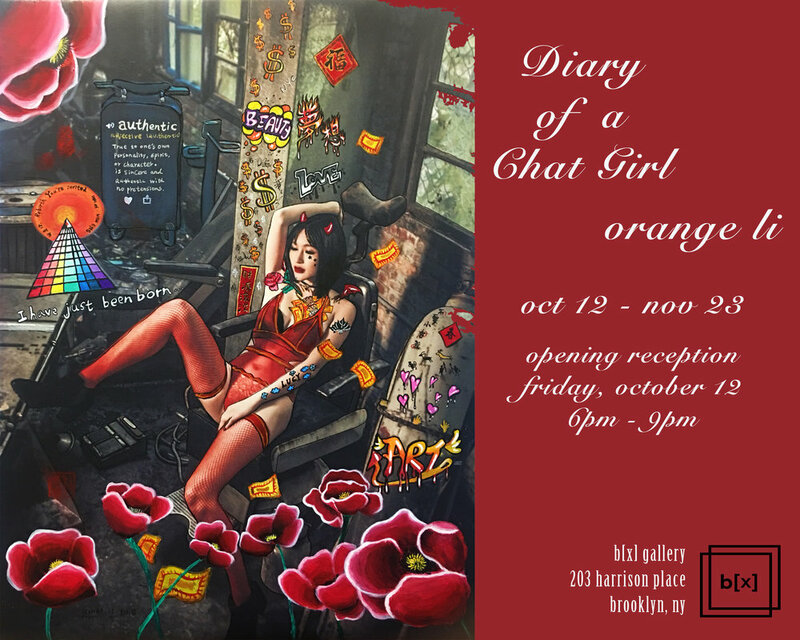 “Diary of a Chat Girl” is a series of mixed media paintings that explores an online chat platform and dives deep into the philosophical and psychological machinery of the mind and human relationships. It is an insightful look at a microcosm of society, and shows the artist Orange Li’s journey from the depths of Hell to her own personal Utopia. 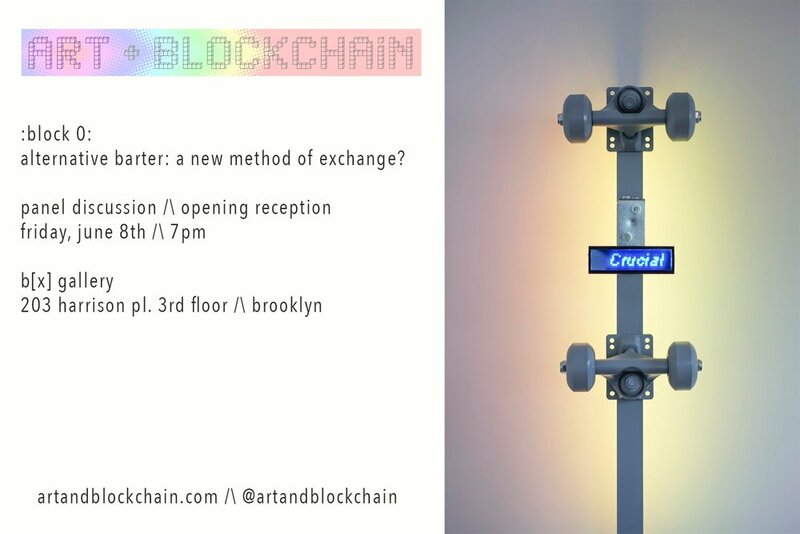 art and blockchain presents: alternative barter: a new method of exchange? Feel. Simple, yet a word that holds much depth. To feel is something that is explored and interpreted in endless ways by all of us every day. How one feels about themselves, about those around them, about their community, their world, their reality; these sensitivities are constantly in flux. As we navigate an increasingly divided society, a polarized political landscape, the dehumanizing affects of late-stage Capitalism, and an increasing addiction to screens, we must fight the inevitable, soothing urge for numbness. To feel numb is to lose feeling and we must always remember how to feel. How to wholeheartedly and earnestly *feel*. It is our humanity. It is our heartbeat. 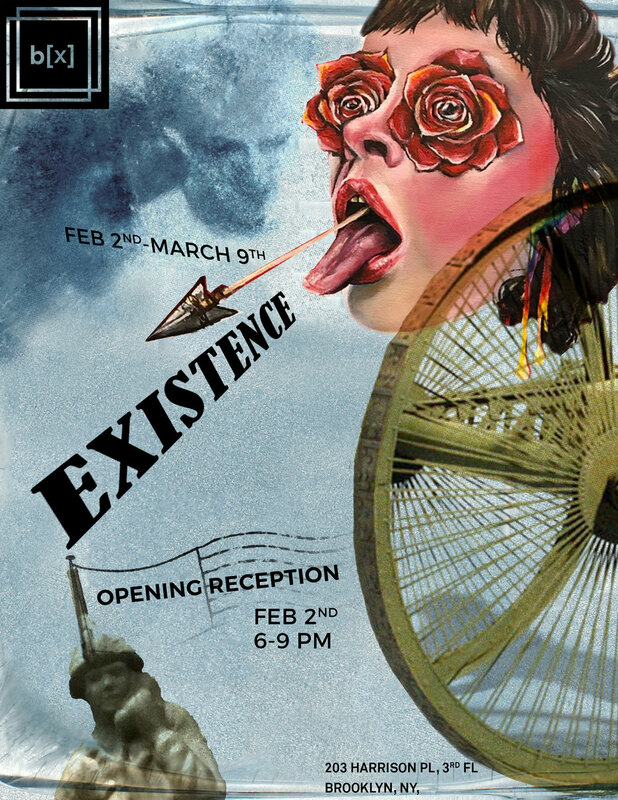 This show will feature Polaroid work from 12 artists that explore this theme. Imagery that explores closeness, humanity, community, and love. These times beg for warmth. Let's feel it. "My work creates absolute, non-hierarchical situations. In that way, I hope my audiences see/experience absolute, non-hierarchical situations which they might never experience in their everyday lives, and I hope these experiences have a positive effect on their lives. Hierarchy and sign are social byproducts which are derived from a male-dominated history. Because signs decide the class structure between objects and persons, I attempt to erase or decontextualize sign in objects. I indiscriminately aggregate objects which are defined by a male-dominated society. I interpret these objects democratically, and assemble these objects for female-centered situations. I see objects and images as phenomena which need to be broken down. " **the show will include workshops and discussions around the topic of community. Please follow our Facebook and Instagram for updates! Christopher Willauer: "It Is You Who Awakens Me"
"It Is You Who Awakens Me"
I believe in a language of the body. A form that communicates and separates, full of intricate scars and wrinkles that read as prose, detachment and secretion that remind us of our materiality, holes and pits that demonstrate a constant hunger. Bodies are a place of experience and experimentation. Working through performance, sculpture, and video I conceptually engage with the body in a ritualistic and reverent manner. In my practice, the body functions both formally and conceptually as an exploration of anxieties, sorrows, pleasures, longings, eroticism, and queerness. These and other points of inquiry have become embedded within my perception of bodies and self. Motivated by a radical tenderness and strange love, I hope to expose myself to initiate a communal intimacy. The universality of bodies creates an opportunity to explore emotions and create visceral experiences in an inclusive manner. This ubiquity allows physicality to exist as a means of depicting what is felt. I have a fascination with the grotesque, repressed, pleasurable, and shameful; this serves as motivation to explore the roots of each and how they are entangled within ourselves. Within this entanglement, issues of identity are brought into question and force the viewer to examine his/her degree of comfort or discomfort. Initiated by an exploration of self, it is my hope that this examination of comfort evolves into new questions and understandings. I am particularly interested in the power of the abject and our power of adaptability; the confrontation of our body’s materiality and the tools developed to cope with our endless questions. Bodies exist in a social construct of high standards and stigmas, motivating shame and repression. I investigate the authority of my own body in relationship to my reaction of its origin. Our bodies are the one living thing we will always know but while we are also passive in its construction we become active in its performance. It is time to reclaim our bodies. a possibility of something happening. How does one play with chance? Is it still chance if someone knows the outcome? Is “second chance” taking chance within a chance? Are we living in a world of Chance? Being born = chance = luck?